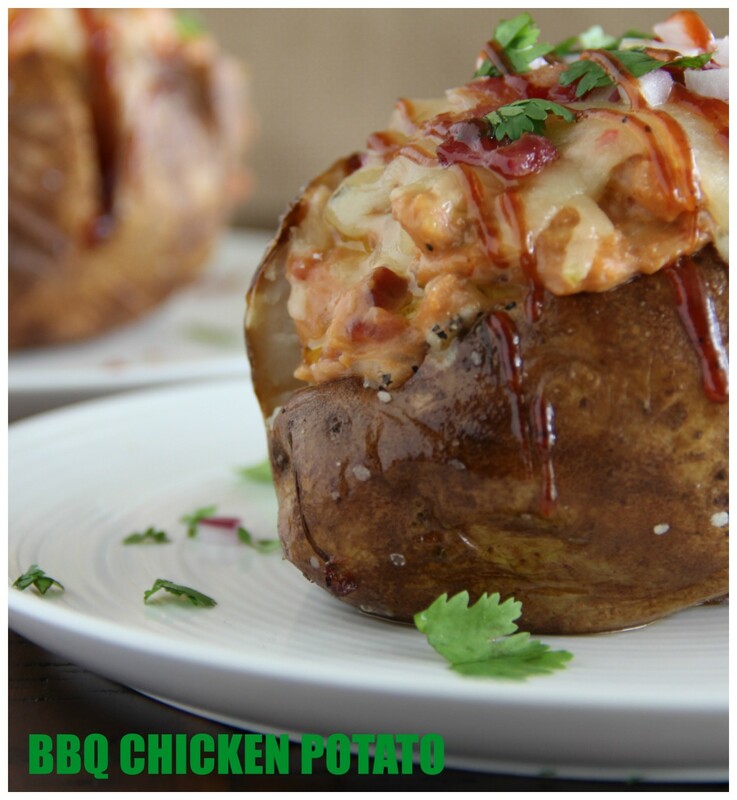 The fun bbq chicken pizza flavors meet the classic baked potato. I started by rubbing 4 huge russet potatoes with canola oil and kosher salt. I baked them for 1 hour at 400 degrees. I then placed 6 slices of thick hardwood smoked bacon (no thin cut bacon here, only thick will do 🙂 ) on a wire rack above a cookie sheet. This is by far the best way to cook bacon in my opinion. All of the grease drips away and you’re left with something altogether delightful. Plus, you don’t end up with popped bacon grease all over the top of your stove. Try it! Place them in the same oven for about 35 minutes until completely done. Pat them dry and chop 4 slices into nice sized pieces. Chop the other two slices separately for garnishing later. Um boy! Try not to eat them right now. I know…its a very tough job! Now chop up 1/2 of a medium red onion, should make about a 2/3 cup. Pour 1 T. of extra virgin olive oil and place 1 T. butter in a non stick pan. Saute the onions over medium heat for about 5-7 minutes until they become translucent. Cut up 8oz. of cream cheese and add to the pan and stir to allow it to begin melting. Toss in the chopped bacon and 2 1/2 cups of shredded or chopped chicken to the pan. I used 1/2 of a store bought rotisserie chicken combining the white and dark meat. Add 1/4 cup of chicken stock and 1/2 cup of bbq sauce. I used Sweet Baby Ray’s, of course. Your choice! Once everything is combined, toss in 1/2 cup of pepper jack cheese and stir until melted. Remove from the heat. Once your potatoes are done and have cooled slightly, make a cut down vertically and horizontally creating an addition sign. Hold each potato with both hands and squeeze the bottom until it opens up for you making a clean palette for your creations. Place 1 T of butter into each potato and salt + pepper to taste. Top each potato with 1 cup of the chicken mixture and then 1/2 cup of pepper jack cheese. Place them in a 350 degree oven for about 5-7 minutes so that the cheese melts. Remove and garnish with reserved bacon, red onion and chopped cilantro. Say Grace and enjoy! Rub 4 large russet potatoes with canola oil and kosher salt. Baked for 1 hour at 400 degrees. Place 6 slices of thick hardwood smoked bacon on a wire rack above a cookie sheet and put them in the same oven for about 35 minutes until completely done. Pat them dry and chop 4 slices into nice sized pieces. Chop the other two slices separately for garnishing later. While the potatoes are baking, chop up a medium red onion, should make about a ⅔ cup. Pour extra virgin olive oil and place butter in a non stick pan. Saute onions over medium heat for about 5-7 minutes until they become translucent. Cut up 8oz. of cream cheese and add to the pan and stir to allow it to begin melting. Toss in the chopped bacon and 2½ cups of shredded or chopped chicken to the pan. Add ¼ cup of chicken stock and ½ cup of bbq sauce. Once everything is combined, toss in ½ cup of pepper jack cheese and stir until melted. Remove from the heat. Once your potatoes are done and have cooled slightly, make a cut down vertically and horizontally creating an addition sign. Hold each potato with both hands and squeeze the bottom until it opens up for you making a clean palette for your creations. Place 1 T of butter into each potato and salt + pepper to taste. Top each potato with 1 cup of the chicken mixture and then ½ cup of pepper jack cheese. Place them in a 350 degree oven for about 5-7 minutes so that the cheese melts. Remove and garnish with reserved bacon, red onion and chopped cilantro. Say grace and enjoy! 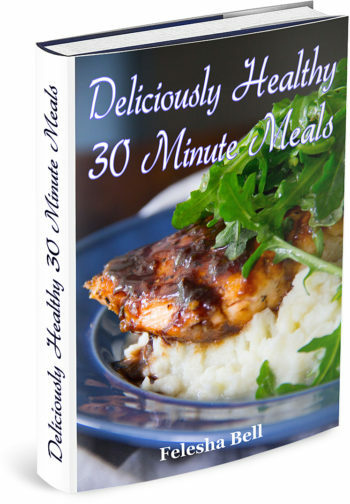 Wow, sounds like a wonderful wintry cozy dinner! Your photography is great! Thanks for sharing! I never thought of combining a bbq pizza with a baked potato. What a fabulous idea. I will be trying this recipe at home very soon. Let me know how it turns out. Thanks for stopping by, Ali! Love this baked potato. It’s SO creative and an awesome new way to dress up boring baked potatos, plus it makes for a great main dish! That is such an interesting combination and I can see how it all will work together, totally!